Haiti Nursing Foundation (HNF) Board members are involved and talented volunteers. They meet quarterly, with a variety of committee meetings held throughout the year. They are sensitive to the trust our donors place in HNF and the Faculté des Sciences Infirmières de l'Université Episcopale d'Haïti (FSIL). The Board has overall responsibility for the policies, programs, and direction of HNF. Members are elected for three-year renewable terms and bring a broad range of nursing education, management, and organizational development expertise. Nearly every member has been to FSIL, some multiple times. Each member signs HNF’s conflict of interest policy annually. 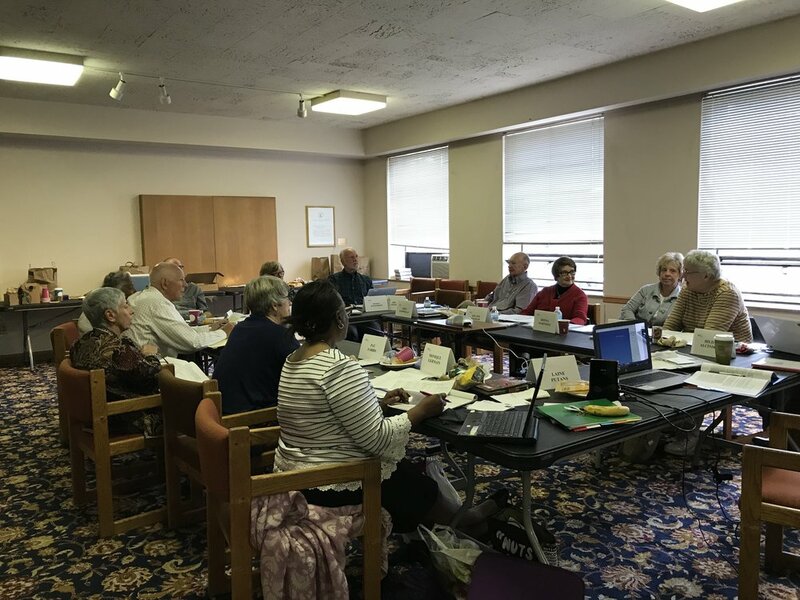 The HNF Board reviews requests for funding to select appropriate projects, approves grants for HNF to submit, and monitors the expenditures of FSIL. HNF’s board is committed to best practices in governance, accountability, and transparency at all levels of the organization. Thom brings extensive experience from working for diverse nonprofit organizations since 1987. Thom received his BS degree from East Tennessee State University and a Masters of Divinity from Columbia Theological Seminary in Atlanta, GA. As a theological student, Thom interned at Trinity Moravian Church in Kingston, Jamaica, learning about the challenges and opportunities of ministry in a developing country. He describes growing up in a family that values service as an essential component of a meaningful life. He has been part of the staff leadership team for three organizations, providing guidance and oversight for each agency and helping guide two of these organizations through periods of significant growth. For instance, during his five- year tenure at Hands on Atlanta, he grew the staff from four employees to 15. Thom brings experience with fundraising, utilizing his skills as a grant writer, project manager and special event coordinator to generate significant agency funding. He has been responsible for organizational communication and marketing activities - inclusive of marketing plan creation, newsletter production, social media marketing and website development. He has carried out a variety of other management responsibilities and he possesses familiarity with many aspects of the non-profit world and organizational development, including financial, governance, strategic planning and volunteer functions. He recognizes the importance of understanding both the “big picture” of an organization, as well as how to actualize that big picture into the day-to-day administration of varied components. Thom embraces the mission and work of Haiti Nursing Foundation and is familiar with the healthcare challenges facing many Haitians. His religious community, St. Clare of Assisi Episcopal Church in Ann Arbor, is an active partner with a Haiti outreach mission project. Thom tells us that "I've been fortunate in my career to gain competence in many areas of successful nonprofit management. Haiti Nursing Foundation offers me a great opportunity to bring all of my experience and skills to bear on the important work of an amazing organization." Thom is married to Karin Stratton, an Informationist Associate at the University of Michigan's Taubman Health Sciences Library, as well as U-M grad student. Thom and Karin have a 5-year-old son, Theodore. Jayna is a Michigan native and recent graduate of Brooklyn College in New York City, where she studied organizational leadership for the performing arts and earned her MFA. During her graduate program, Jayna completed internships in the areas of marketing, development, and strategic planning at several nonprofit arts organizations, including Brooklyn Center for the Performing Arts and The Public Theater, and developed a strong focus on community outreach, engagement, and accessibility. Jayna is an eclectic soul with diverse interests and passions. Prior to her graduate study, she participated in two mission trips to Delmas, Ouest, Haiti, coordinated by her company in partnership with Convoy of Hope. During her first trip, Jayna was truly taken with the Haitian people and returned home feeling called to continue her connection and involvement with the country. After two trips to Haiti, and three long years of searching for a way to reconnect with the country, Jayna is excited and grateful for the opportunity to combine her passion for service to the Haitian people with her skills as a nonprofit manager in her position as Development Specialist for Haiti Nursing Foundation. She finds immense purpose and value in contributing to the progress of HNF and FSIL, and to aiding in the transformation of health care in Haiti. She can’t wait to take her first trip to FSIL for graduation in November 2018! Beyond her work with HNF, Jayna is a lifelong vocalist and musician—singing, as well as playing piano, guitar, and ukulele in her spare time. She has performed professionally in Michigan, Chicago, and New York City, and currently hosts a weekly music video project on Facebook and YouTube called #midweekmusic, which can be found at www.youtube.com/jaynakatz. After nearly five years on the East Coast, Jayna is glad to be back home in the Midwest, closer to her family, and is currently living in Manchester with her high school sweetheart, Austin.